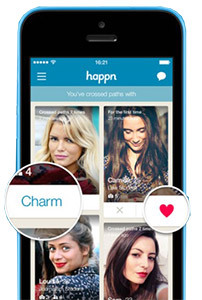 Is The New Happn Dating App The Place To Be? Need a little help finding love? Well, what if I told you there’s a chance you could see the cute guy that was in front of you in the coffee shop line again? Happn is the new dating app that allows for that possibility. We’re all aware of the popular dating apps: Tinder, Bumble, and Plenty of Fish (POF), but what makes Happn the place to be? I downloaded the app and created a profile to see for myself. First, let’s start with the basics. I found the layout and profile creation similar to Tinder due to the fact that they both require you to log-in to the app by hooking up to your Facebook account. Happn will never publish anything to your page and no one will know you’re on the app. Once the log-in is complete, you select the gender and age range you’re interested in and the fun begins! GPS tracking is used to display the profiles of people near you (within a 250-mile radius). It’s all based on making a connection in real life first, which is something I find really interesting. Whether you’re at work, at the subway station or out with friends, there’s potential for you to discover people you’ve encountered. 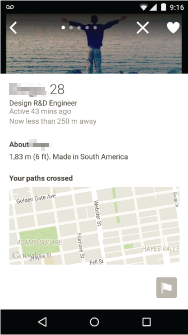 Every time you “cross paths” with another Happn member in real life, their profile will show up on your timeline. Usually, dating apps filter profiles based on location or specific interests, so the timeline is a cool, unique feature. On every profile, you’re made aware of how many times you’ve encountered this person. If you’re not interested in them, simply click the “Cross” button, so that they can secretly disappear from your timeline. Ooh la la, you’ve found someone you’re interested in, so what do you do next? You can secretly “like” them by clicking the heart button. If the feeling is mutual, you’ll be notified and the messaging begins! For the gals who aren’t afraid to make the first move, you can send a “charm” to notify the person that you’re interested. I found the app very easy to navigate. You’re instantly messaged clear instructions once you log into the app. It also lists people’s professions if that’s important to you. Keep in mind that since information is taken from the users’ Facebook profiles, there may be some inaccuracies if someone has not updated their information. The fact that you can send someone a charm to let him/her know you’re interested is cool because you’re assured that the person has seen you (if they don’t return the love, you know where you stand). Sadly, the feelings weren’t mutual for any of the boys that I sent a charm, but I still give the feature a thumbs up! The one problem I did find was that if there aren’t a lot of people in your area (within the 250-mile radius) using the app, there’s not really any action. In the span of two days, I saw only eight profiles, so it will be better once more people start using it.